Over the coming weeks here on the blog, we’ll be taking a closer look at some of the most popular products we offer – their key features, benefits and most common applications. This week, it’s the turn of our plastic moulded safety steps – bold, bright and brilliant! Rotomoulding produces items that are seamless and uniformly thick, which helps to maintain a high level of product integrity. While blow-moulded items are sometimes thinner – and consequently weaker – at the corners and edges, rotomoulded plastic items such as our steps are free from these potentially hazardous weak spots. standard safety steps come in three sizes: a single step stool, a two-step model and a three-step model. All of our standard plastic safety steps are certified to bear up to 180kg in weight, and feature the benefits outlined above. premium safety steps are suited to hardier applications. Covered by BS EN 14183:2003, and with a certified bearable load of 260kg, these steps are 5mm thick and designed to be extra durable. Perfect for outdoor pursuits, the premium range of safety steps has all the benefits of the standard range, including portability, durability and ease of use, plus some extra. Our premium safety steps are also larger, and – in the largest size – can be purchased with an added powder-coated sheet steel handrail. Here at Excelsior, we’ve made a name for ourselves as rotomoulding specialists. We know the business – and the processes – inside and out, which is why we’re a favourite supplier of moulded plastic items across such a wide range of industries. 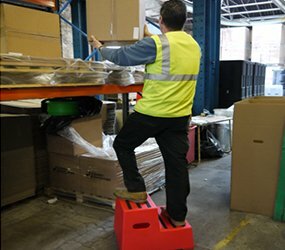 Our moulded plastic safety steps are just one of the items we routinely produce in bulk, and they’ve proved a firm favourite with a huge variety of customers. Safe and stable, hygienic and long-lasting, they’re a high quality product that will stand the test of time. Find out more about the products we manufacture, or discover how to become a stockist for our plastic safety steps.